I have not had much time to blog lately so here is a quick update on what has been happening. 1. Empty Nest – I’m about to have an official empty nest. All 3 kids are off to college as of this weekend. Big changes around the home front. No dependents except for my old dog that seems to be aging rapidly. 🙁 We had to put a baby gate up so he wouldn’t fall down the stairs. 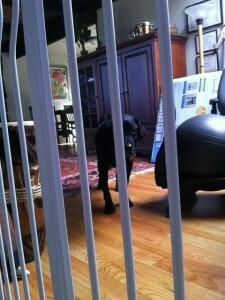 He does not like the baby gate at all! 3. Social Media – I’m trying out Paper.li an automatically generated online newspaper that is created from my Twitter feed. I pick the people, Paper.li chooses the content. You can follow it here. 5. My book about other mothers: I am still plugging away at it thanks to my writing coach Maria Benet who keeps gently nudging me in the right direction. How has your summer been? What are you plans for the Fall? Trivia: How to Prepare Kale Chips is still my all time number ONE most visited blog post.